EAST HANOVER, N.J. — Halls has brought cough and sore throat relief to the pop format for children with the rollout of Halls Kids Pops. The Mondelez International brand said Halls Kids Pops, for children ages 5 and older, combine cough and sore throat lozenges with a dietary supplement in a tasty pop. Varieties include Halls Kids Cough & Sore Throat Pops (cherry and strawberry flavors) and Halls Kids Vitamin C Pops (orange flavor). Mondelez noted that Halls Kids Pops mark a couple of firsts in the pediatric category: the first-ever cough and sore throat pops with menthol as the active ingredient, and the first nationally available vitamin C dietary supplement pop. Each Halls Kids Cough & Sore Throat Pop contains 5 mg of menthol, an active ingredient that temporarily relieves cough and sore throat. 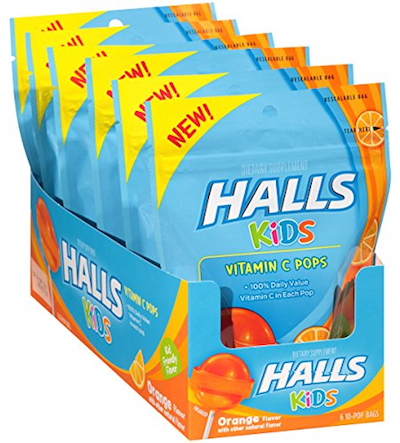 The Halls Kids Vitamin C Pops provide 100% daily value of vitamin C (60 mg). Halls Kids Pops come in resealable bags, each containing 10 pops. The product began rolling out to retailers nationwide starting this month.